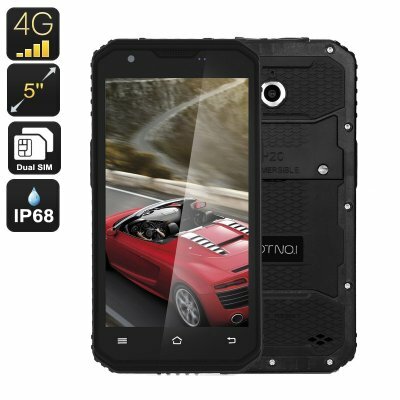 Successfully Added NO.1 M3 Rugged Android Phone - IP68, Quad-Core CPU, 2GB RAM, 5 Inch Display, 4G, Dual-IMEI, 13MP Camera (Black) to your Shopping Cart. The NO.1 M3 rugged smartphone allows you to stay connected to all your friends and family back home while you are enjoying the great outdoors. Perfect for outdoor enthusiasts, this Android phone features a fully-rugged design that has been designed specifically to withstand the toughest of environments. With its IP68 rating this Chinese smartphone is resistant against water, dust, and more – allowing you to carry along this beautiful 5-inch smartphone anywhere you go. Although fully rugged, the NO.1 M3 features a slim design – providing you with a smartphone that can be used perfectly for any occasion. Holding two SIM card slots and Dual-IMEI numbers this Android smartphone allows you to be reachable on two phone numbers simultaneously while using just one device. Being connected to two different 4G network providers significantly increases your connectivity, ensuring that no matter where you’re headed, you’ll always have the means to stay connected to your friends and family back home. Additionally, having two IMEI numbers turns this Dual-SIM smartphone into the perfect device on which to efficiently separate your work and private life. Supporting 4G connectivity means that, with this Android phone, you can always enjoy the fastest mobile network speeds out there – letting you browse the web in lightning speeds and allowing you to stay connected with your loved ones while on the go. With its Android operating system, the NO.1 M3 rugged phone comes packed with all the features Android users are familiar with, providing a smooth overall user experience. Coming with a powerful Quad-Core CPU this Chinese smartphone offers you a sophisticated platform on which to enjoy the latest games, movies, and mobile applications alike. Additionally, its 2GB of RAM make this Android phone capable of dealing with the most demanding of multitasking sessions without dropping a frame. Simply head out to the play store and download one of the many freely available apps, games, or movies. With its 5 Inch IPS display, this smartphone guarantees that you’ll be able to enjoy all media in stunning detail and vivid color, truly bringing it to life in the palm of your hand. Packing a stunning 13MP rear camera, the NO.1 M3 smartphone lets you snap pictures equivalent to that of a professional-grade camera. Whether you enjoy a beautiful scenery on your upcoming holiday, or simply spent a night out with your friends – with this Android phone at hand you can be guaranteed that not a single moment in life goes by uncaptured. Offering up to 16GB of internal storage and space for an additional 32GB external memory, this smartphone is guaranteed to offer enough space for you to save all the beautiful pictures that you’ll snap during your upcoming vacations and outdoor adventures. The NO.1 M3 rugged smartphone comes with a 12 months warranty, brought to you by the leader in electronic devices as well as wholesale electronic gadgets..
Arabic: - IP68 الهاتف وعرة - Chinese Simplified: - IP68 崎岖电话 - Czech: - IP68 Odolný telefon - Dutch: - IP68 Robuuste telefoon - French: - IP68 Téléphone robuste - German: - IP68 Robustes Industriegerät - Hebrew: - IP68 טלפון מחוספס - Hindi: - IP68 बीहड़ फोन - Hungarian: - IP68 Egyenetlen telefon - Italian: - IP68 Telefono robusto - Japanese: - IP68 の頑丈な携帯電話 - Korean: - IP68 견고한 전화 - Malay: - IP68 Telefon lasak - Norwegian Bokmål: - IP68 Barsk telefon - Romanian: - IP68 Robust telefon - Russian: - IP68 Прочный телефон - Spanish: - IP68 Teléfono resistente - Thai: - IP68 โทรศัพท์ขรุขระ - Turkish: - IP68 Engebeli telefon - Vietnamese: - IP68 Điện thoại gồ ghề.